XXXL basket, 1.3 x 2.4 m with 3 entry gates: a swing gate and two sliding midrails. SWL is 350kg, unrestricted in the full working envelope, with maximum outreach 13.4 m.
The basket is mounted on forks. When removed, the XSE can be used for material handling with 500 kg capacity on the forks. 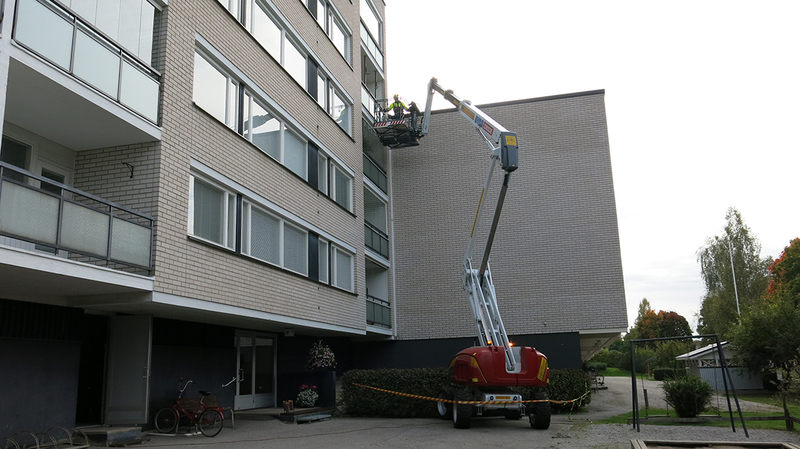 Increased productivity with a combination of boom lift and telehandler. 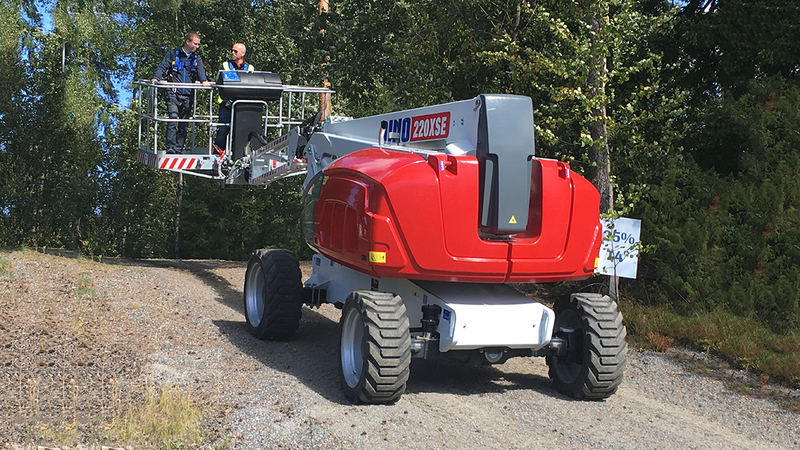 Four wheel drive with oscillating axle and operator controlled differential lock allows easy operation in slopes up to 5°. Direction sensing intelligent driving and integrated SafeGuard secondary guarding increases safety in the work place. 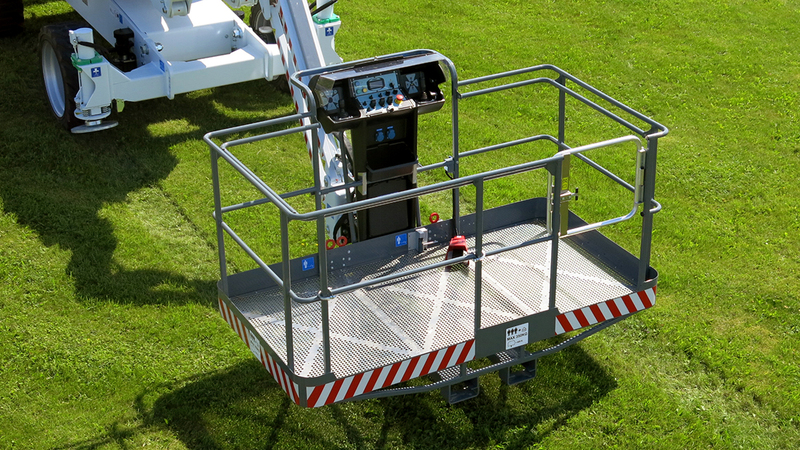 Control panel is easy to use, fully proportional and simultaneous movements – fast and precise operation in all conditions. 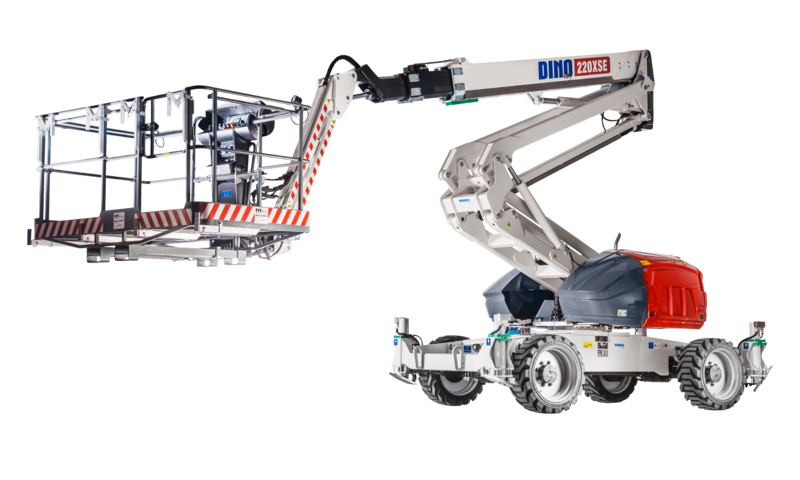 The DINO 220XSE is the right machine whenever there is a need for something more than just the ordinary: a 350 kg basket capacity, an extra large basket for up to 3 persons, ability to operate on inclined ground. The standard machine allows for operation in up to 5° inclination. 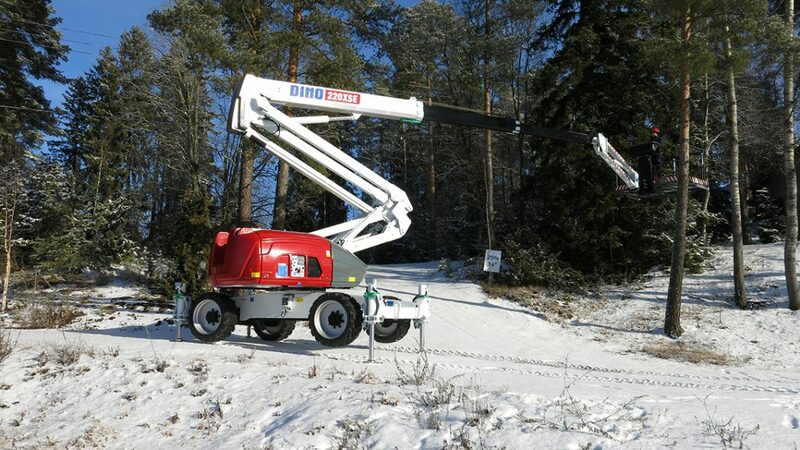 With optional stabilizers, the machine can be operated in up to 12° inclination! 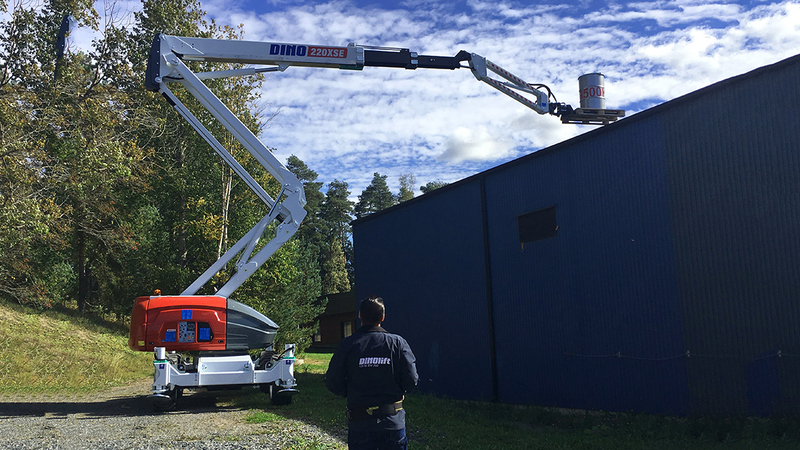 All these features guarantee that the 220XSE goes where other boom lifts cannot go: with more basket capacity and into more inclined ground. 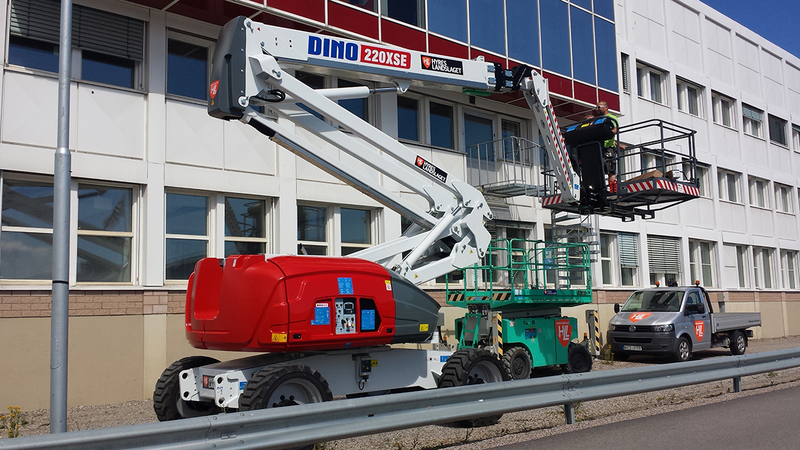 Additionally, for increased productivity in the work place, the DINO 220XSE can easily be transformed into a light telehandler. The basket is mounted on forks with a quick release mechanism. 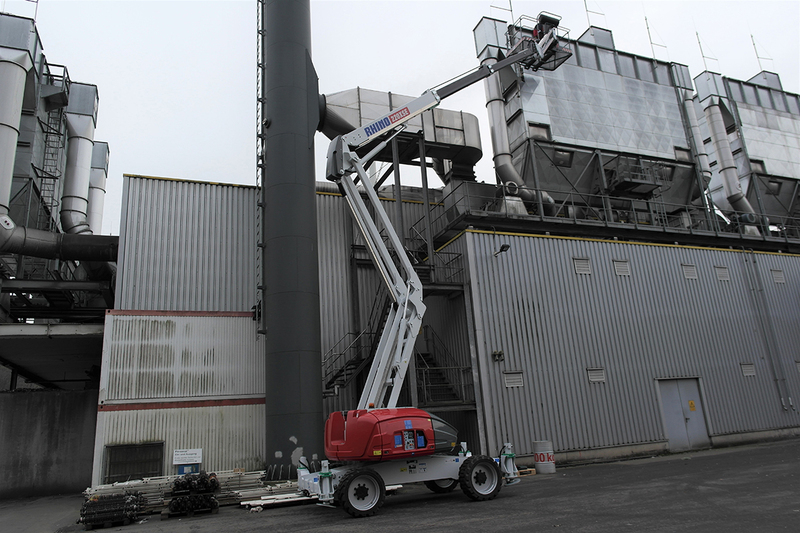 When basket is removed, forks can lift up to 500 kg in the full working envelope, up to 22 m and 13.4 m to the side. 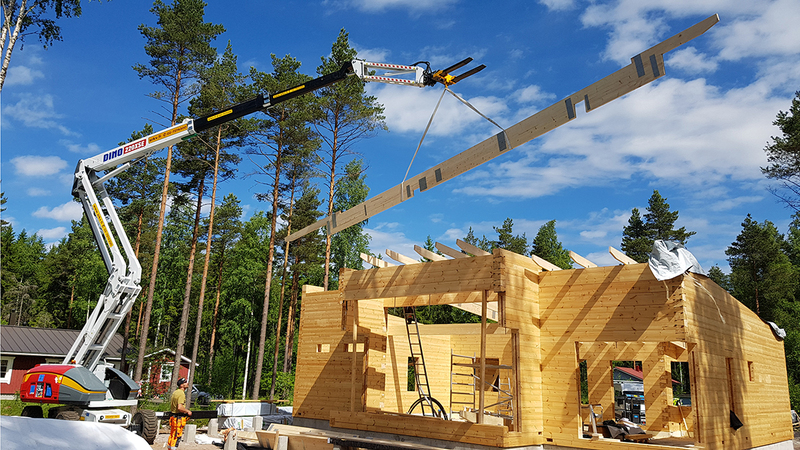 The telehandler mode is operated by cable steering or an optional radio control.